Oregon is known as the Beaver State, but it would be more apropos to label it the Pinot Noir State. I would even suggest that the Oregonians go one step further and name their state Noiregon. This is not a stretch, since Oregonians have a Pinot fixation that consumes them. Pinot Noir is by far the most widely planted grape in Oregon, totaling 9,858 acres out of a total of 17,400 acres (2007 data), second only to California in the United States. Pinot Noir accounts for 50% of total case sales, most of it crafted by small family owned producers who dot the rural landscape of the Willamette Valley. There has been an impression that Oregon’s winemaking community is primarily ex-hippies making Pinot Noir out of garages in their backyards. That might have had some validity back in the 1970s, but nothing could be further from the truth now. The newest generation of winemakers represent highly educated and talented masters of their craft working out of state-of-the-art wineries. By any measuring stick you choose, Oregon Pinot Noir is world-class. Perhaps the greatest vindication of the quality of Oregon Pinot Noir has come from the Burgundians who eagerly attend the yearly International Pinot Noir Celebration in McMinnville, Oregon, and the Steamboat Conference in southern Oregon which precedes it. Domaine Drouhin Oregon was Burgundy’s first committed interest in Oregon, but more are following, including respected vigneron Dominique Lafon, who became a consulting winemaker for Evening Land Vineyards this year. There are five major wine growing regions or appellations in Oregon. Oregon and Washington share the northern Columbia Gorge and Walla Walla appellations. 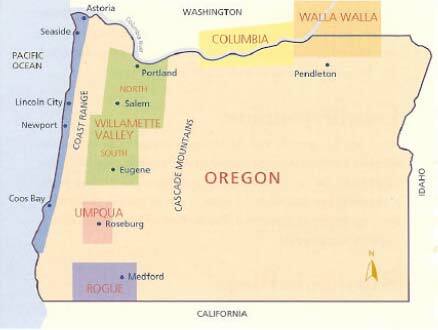 The three western Oregon appellations are the Willamette Valley, the Umpqua Valley, and the most southerly Rogue/Applegate appellation. Some Pinot Noir is grown in selected microclimates in the Columbia Gorge, Umpqua Valley and Rogue appellations and show promising potential, but the Willamette Valley is Oregon’s heartland for Pinot Noir. The Willamette Valley, so named for the river that runs through it, is 150 miles in length and 60 miles wide, extending over 3,438,000 acres from the Columbia River in Portland south through Salem to the Calapooya Mountains outside Eugene. The central Willamette Valley is situated at 45 degrees north latitude, the same as France’s Burgundy region. The Willamette Valley accounts for 75 percent of the total acreage and wine production in Oregon and is divided into a north and south portion, with the border located just below the state’s capital of Salem. The deep alluvial soils (soil or sediment deposited by river water) on the valley floor possess high water holding capacity and are not conducive to grape growing. In addition, the threat of frost is always present at lower elevations, and some of the earliest attempts to grow grapes in Oregon failed because the vineyards were planted on the valley floor. The different soils contribute disparate flavors to the grapes grown in them. THIS IS THE KEY LESSON IN THIS ARTICLE! Willakenzie soil imparts more dark fruits, earthiness, chocolate, anise and spice with more structured tannins. Jory soil, in contrast, tends to produce wines that are redder fruited with sassafras, pomegranate and baking spices with good acidity and softer textures. These flavor profile generalizations are frequently difficult to clearly discover in Oregon Pinot Noir because of the many other variables involved such as vine age, clonal and rootstock material, vintage variation, and the winemaker’s hand. The winemaker in particular can play a significant role, challenging the taster to identify “land or hand?” Specific flavor profiles of the different appellations are often identifiable by the winemaker’s trained palate, but are considerably more challenging for the consumer to recognize. Within the large Willamette Valley appellation, which was approved in 1983, there are six smaller appellations located in the northern valley, each of which have distinctive microclimates, geography and soils. The six include Chehalem Mountains, Dundee Hills, Eola-Amity Hills, McMinnville, Ribbon Ridge, and Yamhill-Carlton District. 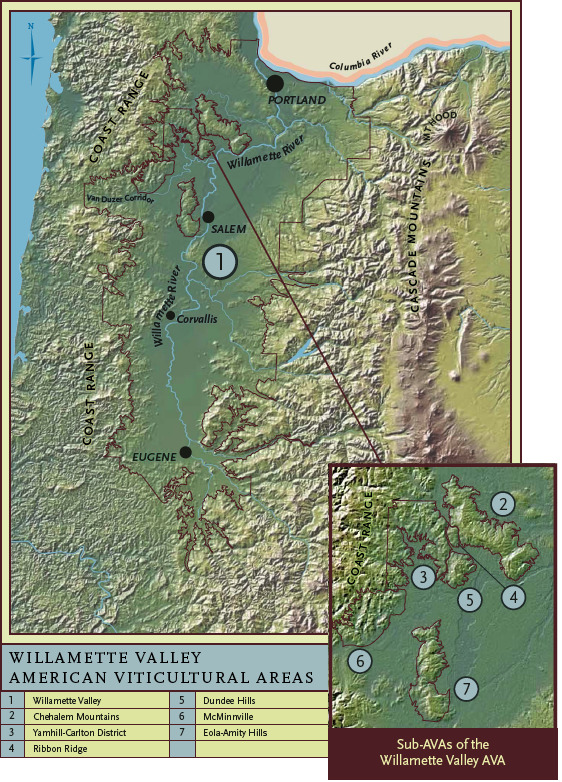 The sub-appellations of the Willamette Valley were conceived primarily by California ex-patriot winegrowers who felt the Willamette Valley would benefit from an appellation system already successfully in place in California, by bringing more visible identity to the specific sub-regions of the Willamette Valley. Initially, several winegrowers in the valley did not receive the idea warmly, fearing that this scheme would fragment the region and dilute the prestigious Willamette Valley image. For the most part, this has not been the case. The locals admit that there is still a tremendous amount of information to be gathered and realize that it will take years to arrive at a definitive picture of each appellation. Winemaker Jesse Lange reflects the current opinion of many saying, “I believe whole heartedly that the AVA system for Oregon has just begun to blossom and will become more entrenched and respected as the vintages accrue. That’s where most of the fun is, aye?” The main underlying goal is to demonstrate differences among the appellations, without implying one appellation is superior to another. A topographical map of the Willamette Valley appellation and its six sub-appellations is on page 3 (courtesy of the Oregon Wine Board). Note the location of the Van Duzer corridor as this will be referenced several times in the following pages, particularly regarding the Eola-Amity Hills appellation. In the following pages, I have profiled each of the six Willamette Valley sub-appellations based on my review of appellation applications to the TTB and discussion with numerous winemakers in the Willamette Valley. In addition, extensive tasting notes gained during my recent visit to the Willamette Valley are provided from each sub-appellation. Finally, a Willamette Valley sub-appellation tasting with the Grape Radio gang will be presented. This will also be available in podcast format soon at www.graperadio.com.